Afternoon tea is a great British tradition and we love our tea drinking. The will be nation celebrating National Afternoon Tea Week in the UK (14th – 20th August) and here at Royal Crown Derby we are acknowledging everything afternoon tea. Over the next few days we will be sharing tea tips and advice on all things afternoon tea so you can create your perfect luxury afternoon tea experience using fine bone china. Created in the 1840’s by the aristocracy in England Afternoon Tea is a typically light meal eaten between 3.30pm and 5pm, to stave hunger between lunchtime and the evening meal. It was said to be invented by Lady Anna Maria Russell, 7th Duchess of Bedford who ate bread, butter and cake with her cup of tea in the afternoon to help with the ‘sinking feeling’ she usually felt around 4pm. Realising this was the perfect refreshment for this time of day, her friends began to join her and invite their own guests to afternoon tea. It quickly grew into a wonderful formal affair in which ladies dressed especially for the occasion in tea dresses, hats and gloves to enjoy their tea with friends, creating it’s own set of etiquette do’s and don’ts with it. Afternoon tea has evolved and grown throughout the years to become a fantastic traditional experience to be enjoyed by all. But there is still some etiquette rules to follow when indulging in this favourite past time. 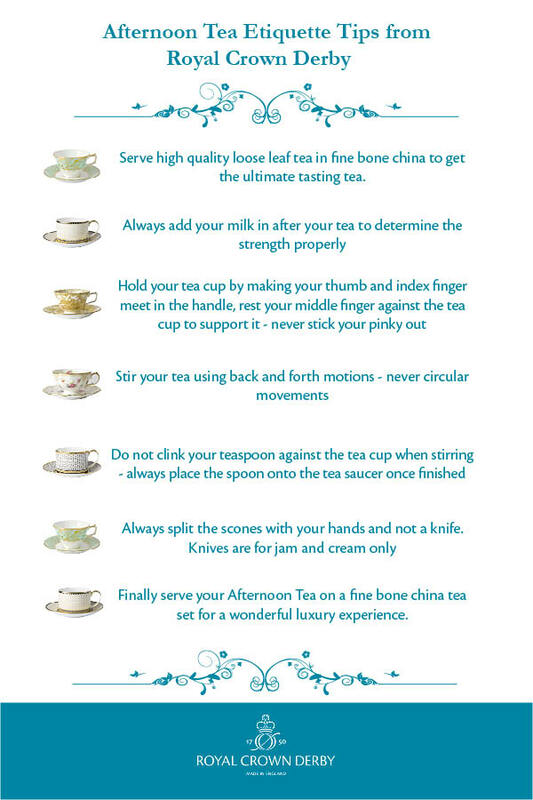 Royal Crown Derby have created a list of afternoon tea etiquette tips so you can make sure to savour this wonderful treat without making any faux pas, take a look below. In honour of National Afternoon Tea Week Royal Crown Derby are offering you the chance to enjoy Tea for Two. 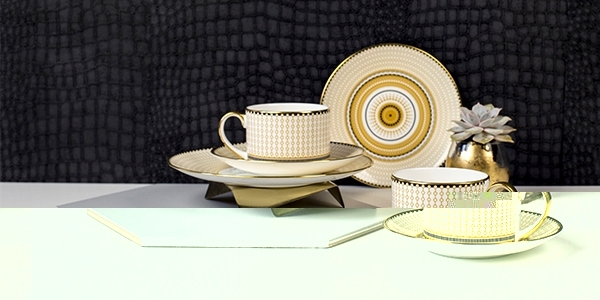 Purchase two tea cups and two tea saucers from the Darley Abbey, Royal Antoinette, Gold Aves and Oscillate tableware patterns and we will complete your Tea for Two with two 16cm tea plates for free. Perfect to enjoy your own afternoon tea for two. You can purchase your ‘Time for Tea for Two’ offers by clicking here.